Last week’s bond-stravaganza was very welcome and, for once, a relatively good news story. The effects of the return to the bond markets by Ireland can be seen below. In the figure below, country by country and relative one to the other, you’re looking at changes in indicative yields for 10 year bonds (Ireland actually has an 8 year bond, but let that pass) by European country. Green is bad on the horizontal, but good on the vertical, in terms of spread differential vs other countries (ht Eoin B for the clarification). Not much else to say really, except you should click on the image for a bigger and easier to read table. Available here. Minor improvement in growth forecast for this year, offset by minor reduction in growth forecast for next year. The NYT profiles PIMCO co-CEO Mohamed El-Erian here. This article collects the views of some of the most active research economists – see here. Lots of interesting information on the distribution of employment and unemployment by occupation and age in this new CSO release here. Author Philip LanePosted on July 26, 2012 Categories Uncategorized2 Comments on Governance for the Eurozone: Integration or Disintegration? 26-07-2012 NTMA Announces Bond Switch and Outright Sale. 26-07-2012 Offering Circular for new 5.50% Treasury Bond 18 October 2017. Since Brendan and Philip have both posted on competitiveness in the past couple of days, I thought I’d follow up with a link to the following piece by Gaulier, Taglioni and Vicard. Eurointelligence points us to a piece by Alan Beattie on the political difficulties which the IMF faces in dealing with the Eurozone crisis. As we know in Ireland all too well, while the IMF has generally been on the side of the angels, it is the ECB and EC that have called the shots, with the result that the IMF’s reputation suffers by association with Troika policies that are a complete and utter disaster. The dilemma for the IMF is that a complete withdrawal from the Eurozone crisis, while the single currency collapses, won’t do its reputation much good either. Charles Goodhart and Sony Kapoor have it right, I think: it is the Eurozone that is dysfunctional, and in the future IMF conditionality has to be directed at the ECB and other Eurozone-level bodies as much as (if not more than) it is directed at individual member states. It’s time for the IMF to decide whether it wants to prove Peter Doyle right, or prove him wrong. Brendan Walsh highlights the importance of the external value of the euro for competitiveness. In fact, recent IMF work (not yet online) shows it is very important for all peripheral countries (even though cross-border finance is primarily obtained within the euro area, cross-border trade is much more extensive). Martin Feldstein has a new FT op-ed also on the importance of a weaker euro here. The role of the depreciation of the euro against the dollar during 1999-2001 in creating divergences within the euro area is analysed in this paper I co-authored with Patrick Honohan. The orthodox view is that enhanced competitiveness should play a significant part in Ireland’s (and other euro area countries’) recovery from recession. The evidence does indeed point to a significant improvement in Ireland’s competitiveness between 2008 and the present. The following two graphs show the ECB’s ‘Harmonized Competitiveness Indicator’ (HCI) based on (a) Consumer Prices and (b) Unit Labour Costs. (A rising index implies a loss of competitiveness.) Both graphs show a competitive gain since 2008, with second showing the more dramatic improvement. However, this measure is affected by the changing composition of the labour force, which became smaller but more high-tech as a result of the collapse of many low-productivity sectors during the recession. Concentrating on the HCI based on the CPI, the Irish competitive gain has still been impressive – our HCI fell 17% between mid-2008 and mid-2012, giving us the largest competitive gain recorded in any of the 17 euro-area countries over these years. Greece, at the other extreme, recorded no change in its HCI, Portugal fell only 4.5%, Spain 6.6%, Italy 6.8%. So by this measure Ireland is some PIIG(S)! However, we need to dig deeper and understand why Ireland’s HCI has fallen so steeply. Part of the story – the part on which some commentators dwell – is that early in the recession the Irish price level and Irish nominal wages fell. 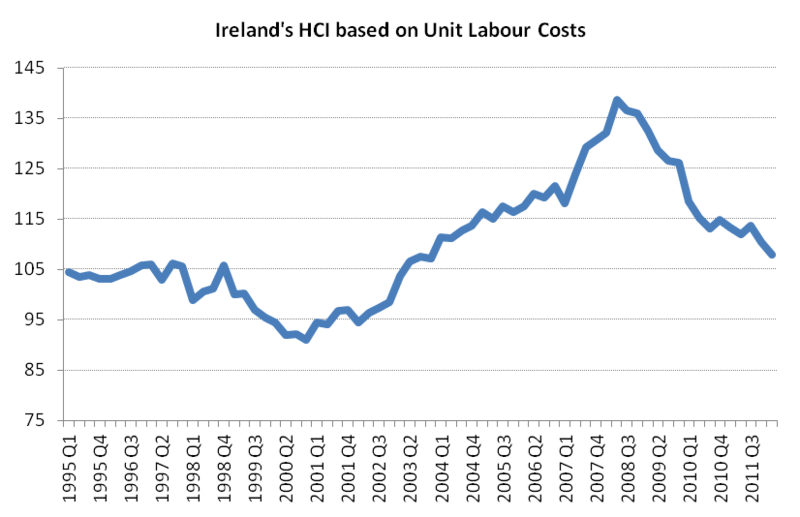 From a peak of 108 in 2008 the Irish Consumer Price Index fell to 100 in January 2010. 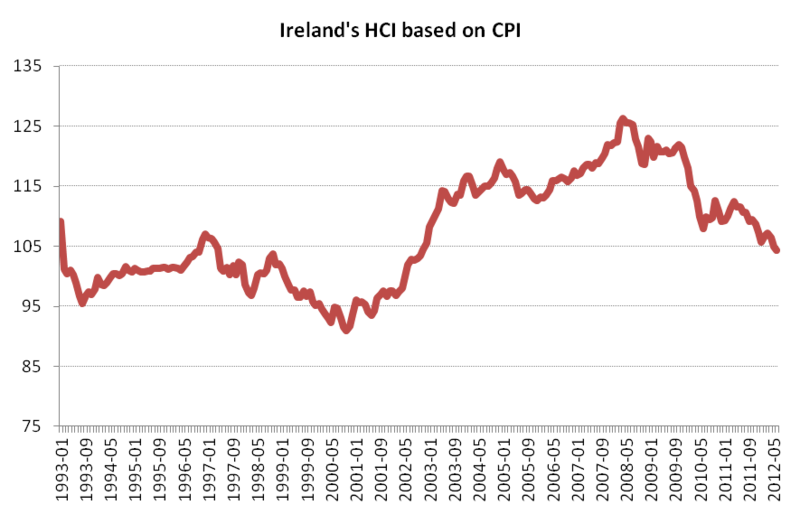 But it has started to rise again – by mid-2012 it was back up to 105. The fall in the Harmonized Index of Consumer Prices has been even less impressive – from a peak of 110 to a low of 105 and now rising back to its previous peak. Wages are more important than prices as an index of competitiveness because price indices are influenced by indirect taxes and include many non-traded services and administered prices. But Irish nominal wages tell much the same story as the price indices. The index of hourly earnings in manufacturing peaked around 106 at the end of 2009 (2008 = 100) and then fell to a low of 102 in 2011, where it appears to have stabilized. Even in the construction sector, where employment collapsed in the wake of the building bust, wage rates declined only 6 per cent between 2008 and 2011. However, the Irish wage and price deflation has not been very dramatic and seems to have stalled in 2011, even though the unemployment rate continues to climb. So why has Ireland’s competitiveness improved so sharply since 2008 if the ‘internal devaluation’ has been so modest? The answer, of course, lies in the behaviour of the euro on world currency markets and the fact that non-euro area trade is much more important for Ireland than for any other member of the EMU. This can be seen by looking at the HCI for the euro area as a whole. The euro area HCI fell from 100 in mid-2008 to 84.7 in mid-2012 – almost as big a fall as was recorded for Ireland and far higher than that recorded in any other euro area country. The paradox that the euro area HCI has fallen much further than the average (however weighted) of the constituent EMU countries is explained by the fact that for each individual country the HCI is compiled using weights that reflect the structure of that country’s total international trade, but for the euro area as a whole the weights reflect the only the area’s trade with the non-euro world. It is understandable that Ireland should show a large competitive gain by euro area standards as the euro declined on world markets after 2008 because non-euro area trade is far more important to Ireland than to any of the other 16 members of the EMU. A fall in the dollar value of the euro does nothing to make France more competitive relative to Germany, or Greece relative to either of them, but it does a lot for Ireland relative to its two most important trading partners – the UK and the US. As a consequence, the decline in the value of the euro on world currency markets, and especially relative to sterling and the dollar, has had a much larger effect on our competitiveness than on that of any other euro area country. 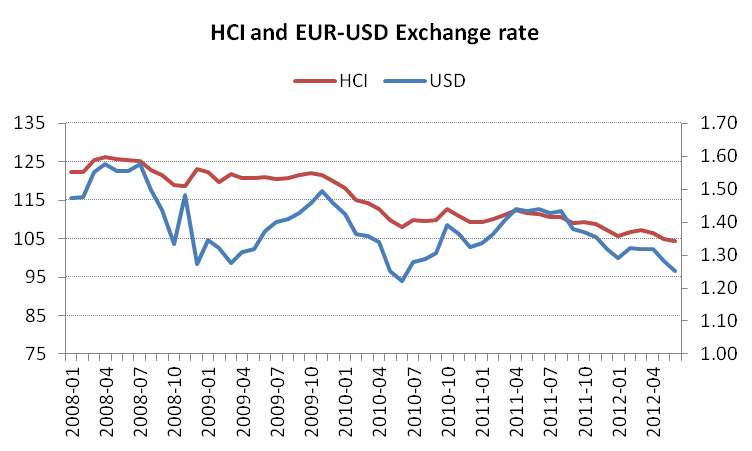 The following graph shows the USD / EUR exchange rate and Ireland’s HCI since 2008. It does not take any econometrics to convince me that the main driving force behind Ireland’s competitive gain has been the weakness of the euro. Undoubtedly a more sophisticated treatment, including the euro-sterling and other exchange rates of importance to Ireland – duly weighted – would show an even closer co-movement. This should alert us to the point that Ireland’s much-praised recent competitive gain has been due more to the weakening of the euro on the world currency markets than to domestic wage and price discipline. No doubt it could also be shown that a significant amount of the loss of competitiveness in the years before 2008 was due to the strength of the euro. The fault – and the blame – lay not with us but with the far-from-optimal currency arrangement under which we labour. Continuing gains in competitiveness would therefore seem to depend more on further euro weakness than on the process of ‘internal devaluation’. Should this have been a condition of our Agreement with the Troika? I am part of an INET-sponsored group that has been considering whether and how a collapse of the Euro can be prevented. Details of our discussions to date are available here. The programme for this year’s event, being organised and hosted in UCC, is available on this link. Details below or on the website. “University College Cork‘s (UCC) School of Economics are pleased to host the Irish Society of New Economists (ISNE) 9th annual conference. The conference will take place on Thursday 23rd and Friday 24th of August, 2012. If you wish to contact the local organising committee they can be contacted at isne2012@gmail.com. The ISNE was formed to encourage research, information and social links among economists at the early stages of their careers in Ireland and Europe. The annual conference is intended for Masters, PhD students, and young professionals in the early stages of research. Eligibility to present has nothing to do with age. We strongly encourage those working on economics-related research in all settings to present. The 2012 ISNE meeting will feature the work and findings of scholars in economics, econometrics and related fields, and will provide an excellent opportunity to present your own research results and work in progress. We look forward to meeting you in Cork in 2012. I looked today at the Coursera list of upcoming courses. Coursera, from their own description, are “a social entrepreneurship company that partners with the top universities in the world to offer courses online for anyone to take, for free. We envision a future where the top universities are educating not only thousands of students, but millions. Our technology enables the best professors to teach tens or hundreds of thousands of students.” They are the most prominent of a number of recent initiatives to make very high quality education available to large online audiences (see e.g. the recent Harvard-MIT edx initiative). Firstly, many of the 111 currently listed upcoming courses will be of interest to readers of this blog. There are several courses in Economics including: Game Theory, Microeconomics, Behavioural Economics (taught by Dan Ariely) and several others. They are all free and all taught by well-known Professors in the field. Some even provide certificates of completion, homework assignments, quizzes and exams. The second reason for posting is to ask what this implies for traditional higher education. There is clearly one school of thought that says the game is up for on-campus education now that the technology for doing this online has come to the point where Coursera can make flexible courses available free for millions of people. And yet, there is no sense yet of a flight from traditional universities and models of delivering higher education. There are so many barriers between making great courses available online and creating full programmes that are validated, credible in terms of assessment and desirable for students in terms of providing a full experience of education, including being able to work with peers, build a network, receive in-person instruction and so on. None of these seem insurmountable so one scenario might be a fully online university environment. Tyler Cowen summarises a discussion among a number of people who have been debating this issue in the US. He comes down on a viewpoint I share (largely from intuition as we really dont have anyway of knowing yet) that hybrid models will begin to proliferate soon merging online instruction with on-campus instruction. Addendum: Berkeley joins Edx. List of courses here. The IMF’s concluding statement on its recent mission to Ireland is here. The staff report for its recent euro area mission is here, while the ‘selected issues’ paper is here. The lead WSJ article today reports that the ECB now advocates the bailing-in of senior bondholders. The Workshop’s annual Economic Policy conference will be held at the Ardilaun Hotel, Galway, from October 12th to 14th next. Invited papers will focus on the Eurozone banking and sovereign debt crises and on Ireland’s fiscal consolidation programme. Contributed papers are invited on these topics and in any area of Irish economic policy. Brief proposals should be forwarded to colm.mccarthy@ucd.ie before August 20th. The programme and booking details will be circulated early in September. A new working paper with results for 24 EU countries (few words, lots of charts) by Zsolt Darvas at Bruegel – a background document for his earlier paper on which Kevin O’Rourke stimulated a debate. The Celtic Tiger died five years ago. The economic crisis hurts. The end of the pain is not in sight. So you would think that the government would do everything it can to keep prices low. For energy prices, you would be wrong. Natural gas is an important fuel for heating homes and cooking. It is also used to generate electricity. The gas used in Ireland comes via two pipelines. Bord Gais Eireann (BGE) owns and operates both interconnectors. BGE cannot abuse its market power because the Commission for Energy Regulation (CER) regulates the price. Each year, total costs are divided by the volume of gas transported. BGE is allowed a modest profit. This simple rule was fine when there was one source of gas only. That will change. Eventually, the gas from Corrib will be brought onshore. There are advanced plans to build an Liquefied Natural Gas (LNG) terminal in Kerry. With LNG, Ireland would no longer depend on the European market, where gas is dear. Gas is cheap in North America because of the abundant shale gas. As gas transport is expensive, it would be cheaper still to exploit the Irish shale reserves. The costs of interconnection with Great Britain are largely fixed. If another source of gas captures a small part of the market, BGE will spread its costs over a smaller volume. That is, BGE would raise its price. The competition would thus capture a large share of market, and be able to raise its price at the same time. BGE would be forced to raise its price again. The CER anticipated this and has changed the price regulation. The CER should be praised. It is not often that a government agency locks the door before the horse bolts. However, the new regulations are not good for consumers. In the future, the right to transport gas over the interconnectors will be auctioned. There is overcapacity now and probably in the future, so the highest bid will not be very high. Therefore, there will be a reserve price. And if BGE still makes a loss, a levy will be imposed on all importers and producers of gas. This levy will be passed on to consumers. This arrangement guarantees the profits of BGE. It drives up the price of gas and electricity. And because it hurts would-be importers and producers of natural gas, competition is hampered and prices go up again. Indeed, the Shannon LNG project was stalled earlier this week, primarily because of the new price rules. The CER in effect shielded BGE from competition at the expense of anyone who buys gas or electricity. BGE is largely state-owned, but a minority share is owned by employees, who will directly benefit from the new CER regulation. The exchequer could benefit too, but state-owned companies in Ireland have a poor track record of paying dividends. Instead, profits are diverted to vanity projects of managers and politicians. It would therefore be better if BGE gradually writes down the capital invested in the gas interconnectors, and compete in the market on the basis of its variable costs only. Gas and electricity would be cheaper. The new pricing rules are not yet set in stone. It will be a few years before households will pay more for their gas and electricity. People will complain bitterly to Pat Kenny and #gasprice will trend on Twitter. But then it will be too late to change the rules. The CER should reconsider now. After a long absence, oil exploration companies returned to Irish waters. There is oil in the Atlantic. Now that experience is growing with the ultra-deep oil off Brazil and Angola, there is increasing confidence that the oil in the Irish Atlantic too may be commercially exploited – although the water is colder and choppier. This is good news. Oil exploitation brings well-paid jobs and welcome royalties. It is early days though. Some commentators and politicians have jumped to the conclusion that there is an immense richness under the Irish seabed that is being plundered by foreigners, and have called for punitive taxes. Fact is, a few companies are exploring for oil. They are losing money at the moment, and it will be ten years or more before they would see a return on this investment, if any. There are plenty of other oil provinces that look just as promising as Ireland. Shell’s troubles in Mayo are well known in the international oil industry, and the story of Shannon LNG is making the rounds. Talk of high taxes, even nationalization, may well scare off the next round of would-be investors in Irish oil. The goose will be slaughtered before it has laid its first egg, perhaps golden. England has a problem. Power plants are aging, and no one is willing to invest in new ones. The European Commission has imposed stringent targets for renewable electricity. The plan is now to build a great many wind turbines in the Irish midlands, and transmit the power to England. The wind blows harder in Ireland than in England, but this does not justify the extra cost of long distance transmission. Rather, locals effectively use the English planning regulations to block new wind turbines. Transmission will be over a dedicated grid. EirGrid would not have to invest even more than it already does, and English wind would not be eligible for the generous subsidies on Irish wind. So what does Ireland get out of this? Some construction jobs, fewer maintenance jobs, and more wind turbines to look at. It seems that England struck the better bargain. Wind power should pay royalties, just like oil and gas pay royalties. England would contribute money to the Irish exchequer if they still want to go ahead. Royalties would make wind power more expensive in Ireland too, another reason to switch to cheaper gas for power generation. Paul Hunt had excellent comments on an earlier version. An edited version (part 2, 3) appeared in the Independent. Without byline online but on paper there is apparently a picture and a wrong email address. UPDATE: John Mullins, CEO of BGE, disagrees. After a temporary misstep the latest Quarterly National Accounts have now been released. For Q1 2012 they show that real GDP dropped 1.1% in the quarter so this poll was fully wrong while this poll was somewhat right. To add to the confusion the release shows an economy that has contracted but exited recession at the same time. The Q4 2011 change has been revised from a quarterly contraction of 0.2% to an expansion of 0.7% meaning that there was not two consecutive quarters of contraction following the decline in Q3 2011. In fact, there has not been two consecutive quarters of GDP contraction since the end of 2009. This is very much an L-shaped recession. The National Income and Expenditure Annual Results for 2011 have also been released. Real GDP growth for 2011 was 1.4% but there was a GNP decline of 2.4%. Nominal GDP was just under €159 billion. As expected the Balance of Payments shows a small current account surplus for 2011. If the BoP numbers aren’t big enough you can always have a glance at the Quarterly International Investment Position and External Debt figures. The net column shows that there are lots of big numbers on the asset and liability sides. FTAlphaville have put up a post that links to a draft of the Memorandum of Understanding for the loans to be provided by the EFSF to recapitalise the Spanish banking system. At first glance there are many similarities to what was followed in Ireland. There is no bailing-in of senior bank creditors and all senior bonds seem set to be repaid in full. An Asset Management Company will be established to remove bad loans from the banks’ balance sheet. There is lots more detail.